Tiresome sequel which lacks the charm of the first film, not to mention its star attraction: Jean-Claude Van Damme. 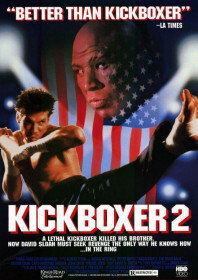 Instead, Dallas actor Sasha Mitchell steps into the lead role, but he never comes close to matching his predecessor during the physical scenes, which is quite important for a film with the word ‘kickboxer’ in the title. He plays a third Sloane brother: the good natured pretty-boy David, who inherits his brother’s LA gym after it is revealed that both Kurt and Eric have been killed by the Muay Thai monster Tong Po (Michel Qissi). David is initially lured back into the ring to raise some cash on the legitimate kickboxing circuit – smashing up Matthias Hues in the ring – before his gym is torched and he becomes destitute. His brothers’ former master, Xian (Dennis Chan), spontaneously returns to spout some eastern wisdom in his ear and get him back into shape, before a weird contrivance involving one of his former students puts him into direct conflict with Tong Po. It concludes with what is essentially a repeat of the same events from the first film. Director Albert Pyun – who made Cyborg with Van Damme in 1989 – treats Tong Po as a snorting, bestial presence, swamping the final act in slow-motion, blood, sweat and muscle. It’s the only part of the film which manages to convey anything close to conviction, apart from maybe the actors Peter Boyle and Cary-Hiroyuki Tagawa, who both add a touch of class to their roles as corrupt sports promoters.